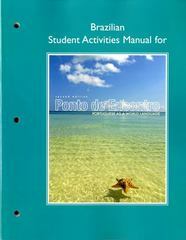 Brazilian Student Activities Manual for Ponto de Encontro 2 Edition There is a Brazilian version and European Portuguese version of the Student Activities Manual. The organization of the Student Activities Manual follows that of the main text, providing further practice of each chapter’s vocabulary and grammatical structures through sentence-building and completion exercises, fill-ins, and art- and realia-cued activities. Reading and writing activities include strategies for improving reading and writing skills. The audio recorded passages are followed by comprehension-check activities. The video based activities test students’ comprehension of the video and invite them to react to the experiences and opinions expressed by the speakers. A substantial appendix to both SAMs provides additional targeted practice for Spanish-speaking learners of Portuguese.